Thyme is one of the most popular aromatic herbs used in the kitchen, but it also has a long history of ritual and medicinal uses. The medicinal properties of thyme, as well as its pleasant fragrance and its popularity as an ornamental plant, are proof of the versatility of this Mediterranean herb. Considered as a quintessential Mediterranean spice, thyme has been one of the favorite herbs of European cuisine for centuries. However, its great popularity goes beyond its pleasant taste: thyme also possess great medicinal value and it has been used since ancient times to treat various ailments. Disinfecting wounds and scrapes. Thyme is an antiseptic, antimicrobial, and antifungal, making it an ideal disinfectant. Preventing asthma attacks. Mild antispasmodic properties are helpful for preventing muscle spasms that are part of asthma attacks. Relieving upper airways. The same mechanism that helps prevent asthma attacks helps to relieve cold symptoms, including coughing and throat irritation. Treating fungal infections. 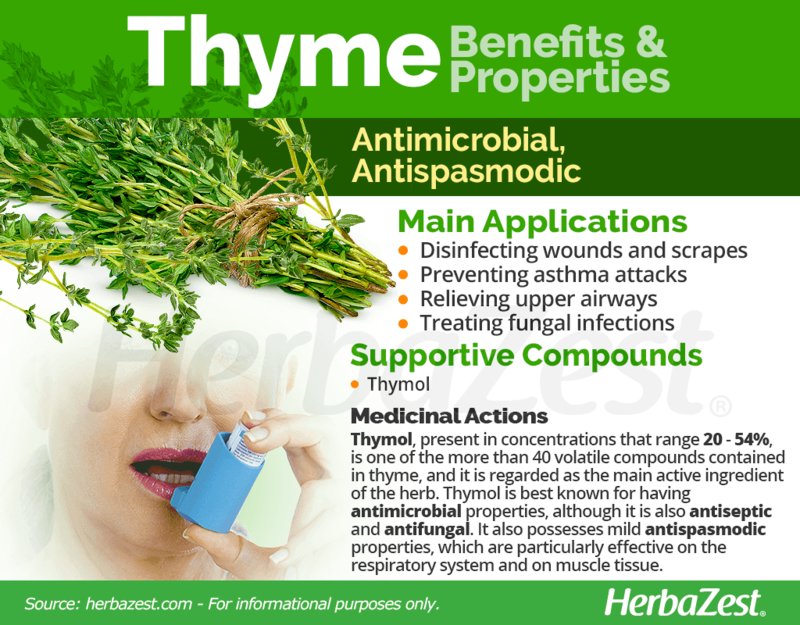 The antifungal and antimicrobial properties of thyme help control infectious diseases due to fungal overgrowth. 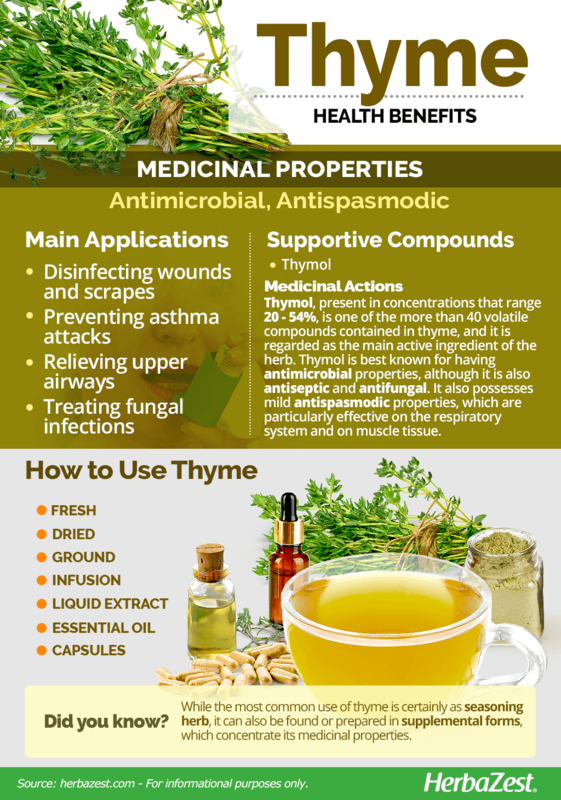 Thyme is known to contain more than 40 different volatile compounds, but thymol, present in concentrations that range 20 - 54%, is regarded as the main active ingredient of the herb, responsible for most health benefits of thyme. Thymol is best known for containing antimicrobial properties, although it is also antiseptic and antifungal. It also possesses mild antispasmodic properties, which are particularly effective on the respiratory system and on muscle tissue. THYMOL IS BEST KNOWN FOR HAVING ANTIMICROBIAL PROPERTIES. Thyme leaves and stems are rich in antioxidants and flavonoids, both of which may carry anti-aging effects, although further research is needed to corroborate this claim. Antispasmodic properties are also present in herbs like guelder rose and oregano, whereas basil and Oregon grape can provide similar antimicrobial benefits. Thyme is considered generally safe when consumed in culinary amounts. However, it can trigger allergic reactions in those who are sensitive to other herbs of the Lamiaceae family. The topical use of thyme essential oil may cause dermatitis. The internal use of thymol, an active compound of thyme present in all medicinal preparations of the herb, can cause abdominal pain when taken in therapeutic doses (0.3 - 1 g). When medicinal forms of thyme are taken in excess, the herb can alter the menstrual cycle. In medicinal forms, thyme may elevate blood pressure and counteract the effects of antihypertensive drugs. The medicinal use of thyme is not recommended during pregnancy and breastfeeding, since further research is necessary to investigate the effects of the herb during these stages. A health care professional should be consulted before start taking any herbal supplements. 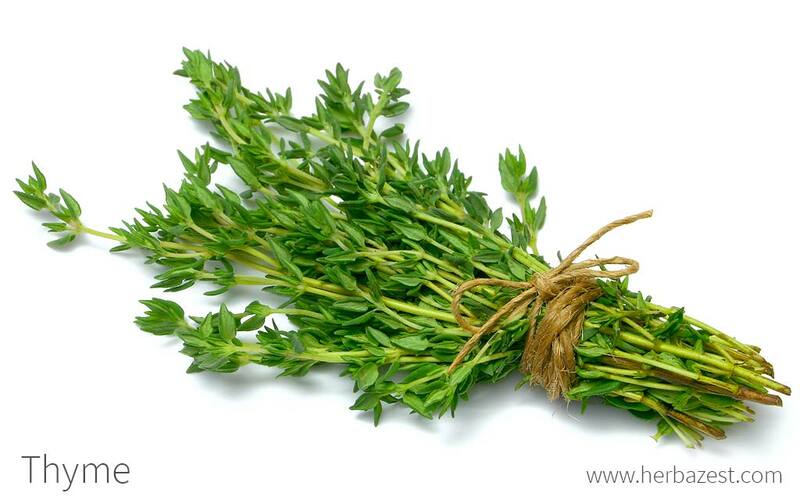 The most common use of thyme is certainly as seasoning herb in a variety of culinary recipes. However, it can also be found or prepared in supplemental forms, which concentrate the medicinal properties of thyme and are more appropriate for medicinal use. Fresh. Fresh thyme is frequently used as a flavoring agent and garnish on larger dishes. However, for remedial use, it can steepen in hot water to extract its medicinal properties. Dried. The most common use for the dried leaves of thyme is culinary, but they can also be prepared in medicinal ways. Ground. This is one of the easiest ways to find the herb in any home, along with black pepper, basil, and rosemary. Infusion. The leaves of thyme, fresh or dried, have been brewed for centuries as a popular way to extract the essential oils and medicinal action of the herb. Liquid extract. The antifungal, antimicrobial properties of thyme are concentrated in this form, that can be applied topically or being diluted in water before oral consumption. Essential oil. The essential oil of thyme retains the aromatic and antiseptic properties of the herb, and van be applied directly to alleviate skin problems, such as acne, fungus and dermatitis. Capsules. 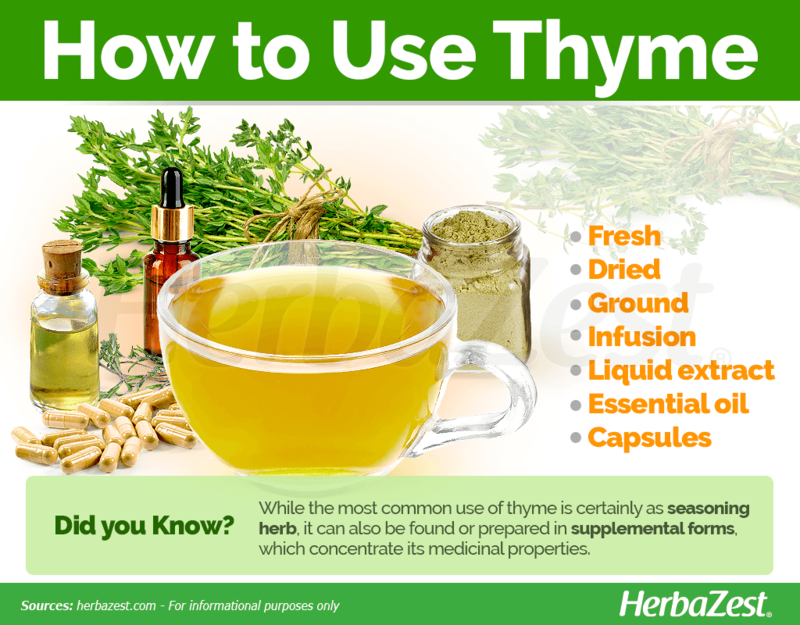 In this supplemental form, thyme can usually be found combined with other herbs, such as fenugreek, to enhance its strength or complement its effects. Historically, thyme has been used as a culinary ingredient in both Mediterranean and Arabic dishes. While fresh thyme is a common sight during spring and summer, when it can be found in supermarkets and local farmers' markets, thyme seedlings and seeds are readily available at many local nurseries and garden stores, as well as through online retailers. Dried thyme leaves, considered a cooking essential by many, can be found in grocery stores and supermarkets year-round. Thyme is usually sold in a bunch and should be used relatively soon after purchase, as fresh herbs have a significantly shorter shelf life. Due to their relative rarity, the best way to purchase thyme supplements is through online retailers. Pure supplements overwhelmingly appear in oil form, but gel liquid-filled capsules are also available, especially in combination with other herbs. Specialized health stores may also carry these products, though they are less common than other remedies. A low-maintenance evergreen shrub, thyme is a rustic plant that can adapt to various conditions. The thyme herb can survive temperatures as low as freezing, but ideally it prefers a range from 60 - 70°F (16 - 21°C), in keeping with the temperate of its native climates. Interestingly, too many nutrients may cause overgrowth, so a light, sandy soil with a good drainage is better for the thyme herb to thrive. Regular pruning is necessary to prevent thyme plant stems from becoming woody and spindly, especially in warmer climates. The thyme herb requires ample sunlight - at least six hours daily. Seeds take approximately 16 - 28 days to germinate, though it is more common to propagate the thyme plant from clipped stems. The thyme herb can also be grown indoors near a window that receives sufficient sunlight. More detailed information about growing thyme can be found in the herb garden section. Thyme is an evergreen bush that covers more ground than it stands tall, reaching up to 16 inches (40 cm) in width but just 12 inches (30 cm) in height. Its pink or purple flowers bloom in early summer, and its gray-green leaves emit its trademark smell. The thyme plant, or common thyme, belongs to the Thymus genus and the Lamiaceae botanical group, also known as the mint family, which includes many aromatic herbs used in cooking today, such as basil, peppermint (Mentha x piperita), rosemary (Rosmarinus officinalis), sage (Salvia officinalis), oregano (Origanum vulgare), and lavender (Lavandula officinalis). Thymus vulgaris is divided into two subspecies: Thymus vulgaris subs. aestivalis and Thymus vulgaris subs. vulgaris. Several cultivars have also been developed, such as 'Silver Queen' and 'Argenteus'. Other species in the Thymus genus also use the common name of "thyme." Lemon thyme (T. citriodorus) and caraway thyme (T. herba-barona) are often used as seasonings for food, while wild thyme (T. praecox) and woolly thyme (T. pseudolanuginosus) are primarily ornamental plants. Common thyme (Thymus vulgaris) is the most abundant of them all, as it is employed to both culinary and medicinal ends. Those who foster herb gardens for personal use generally prefer this species to others. Historians agree that the thyme plant was probably cultivated for the first time in the Fertile Crescent, from the Mediterranean basin to Mesopotamia and Persia, about 5000 years ago. It is believed that the medicinal properties of thyme were discovered around that same time. Its first uses have been debated, but it is known that in ancient Egypt the thyme herb was an important ingredient in funerary rituals, particularly in the embalming process. THE NAME OF THYME COMES FROM THE GREEK WORD THUMOS, WHICH MEANS "SPIRIT." For the ancient Greeks, thyme was a source of courage, and they used this herb to perfume their temples and baths. Later, Christian mythology included thyme in the manger where the birth of Jesus took place, thus maintaining its popularity throughout the Middle Ages and across the world, during the expansion of Catholicism. Aromatic spices form a significant part of the exportation industry worldwide, estimated in 2012 at a value of $1.6 million USD worldwide. Particularly in southern European countries, thyme contributes greatly to that end. Spain leads the way in its production, generating 90% of the world's supply of its essential oil, though France, Italy, and Bulgaria also benefit from the industry. Fresh leaves and stems are in high demand for culinary purposes, but the distilled oil made from these parts has proved more economically fruitful. Gardening. Thyme makes a great ground cover in any garden. Because of its attractive flowers, and agreeable aroma this aromatic herb has become a favorite ornamental all over the world. Industrial. Because of its antimicrobial action, the essential oil from thyme leaves is also employed as an antiseptic ingredient in mouthwashes, and it is the active ingredient in some all-natural, alcohol-free hand sanitizers. Personal care. Thyme is also widely used in the perfume and cosmetic industry, where its fragrance and antiseptic properties are employed in the fabrication of perfume, soap, and many other personal care products. Household uses. Additionally, thyme essential oil serves as a natural mold remover, which is an interesting household use for the herb. Germplasm Resources Information, Taxon: Thymus vulgaris L.